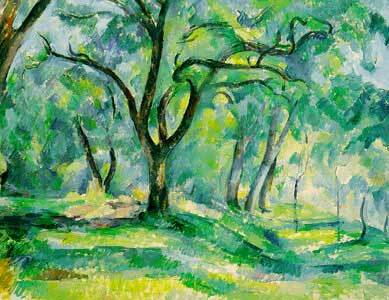 The forest by Paul Cezanne is an oil on canvas. I like the fact that it is only three colors and the painting looks creepy. i like the dark shadow and the light shadowing on different sides of the painting. this reminds me of when i was a child and i use to go down south and run through the woods. thats why i like this painting a lot.